The MiniDMXter4tm puts power in the palm of your hand. 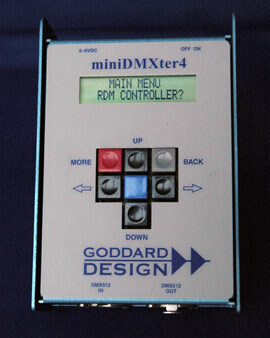 Now with DMX capabilities similar to the old Lil’DMXtertm, the MiniDMXter4tm adds RDM management functions. Imagine everything you’ve always liked about the MiniDMXtertm with some of your favorite Lil’DMXtertm features mixed in - that’s what you’ll find in the MiniDMXter4tm. A 2 line by 20 character display, now backlit. Two additional buttons give you access to a range of powerful features never offered in a Mini before - like Flicker Finder and ShowSaver. Software updates are easy, using a USB port. The MiniDMXter4tm is small - 3.75" x 6" x 1.75". It’s powered by 2 AA batteries, battery eliminator available. It’s very easy to use. The 7 button interface provides improved menu navigation and the 40 character backlit display provides clear, plain language prompts. The MiniDMXter4tm's receive input is properly terminated at all times. The user may turn on the transmitter during reception to allow for loop thru mode (excluding pins 4 and 5). Both input and output support DMX512-A and RDM topologies.